Using MLI Blankets under poor vacuum conditions - Meyer Tool & Mfg. Occasionally we at Meyer Tool are contacted by someone who has heard of superinsulation but isn’t familiar with its use. Naturally they wish to use this superior product in their application, which doesn’t involve a vacuum in any way. It is easy to explain to the person with such an inquiry that superinsulation or multilayer insulation (MLI) works only as part of a vacuum insulation system. Recently, however, we were asked a question that caused us to do some thinking. The application in question had a high heat load but the vacuum could only be maintained at a 10-2 torr level. So the question was, “Would a multilayer insulation provide any value in such a situation?” Our initial thought was it would, but then we tried to think outside the box. The following is our attempt at addressing the underlying problem. ​At pressures below 1 x 10-4 torr conventional MLI blankets, under good conditions, may yield an effective k value of roughly 8 x 10-5 W/mK with a corresponding heat flux of roughly 0.8 W/m2 when operating between 300K and 80K. These values are obtained under "test" conditions, and more conservative values are normally assumed for design purposes. 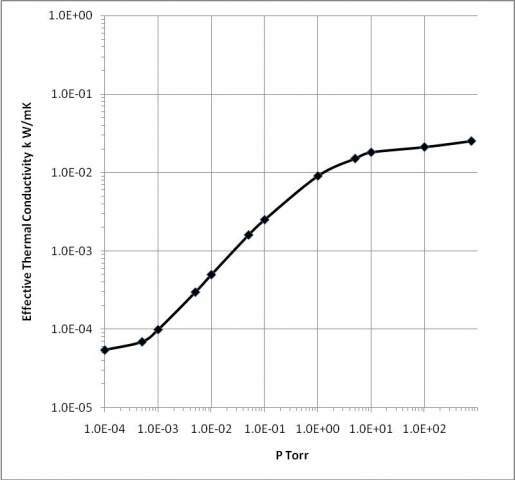 Above 10-3 torr the performance of an MLI blanket deteriorates rapidly, with k increasing from its low-pressure value by an order of magnitude at 10-2 torr. Figure 1 illustrates how the effective thermal conductivity k of a typical MLI blanket would be expected to change with pressure. MLI is able to achieve very effective isolation from radiated heat because of its multilayer structure, with each successive layer reducing the heat load on the next by a fraction. At high pressures, conduction through the residual gas adds directly to the heat load on the cold surface and also thermally shorts the layers of the MLI blanket. Obtaining the best possible performance from an MLI blanket requires an adequate isolation vacuum. Achieving an adequate isolation vacuum starts with accurate pressure measurement. A vacuum gauge attached to a pumping station may give deceptively low readings and even a vacuum gauge mounted directly on the chamber may read a pressure much lower than the pressure inside the layers of the blanket. There are situations in which time and pumping speed are limited and an MLI blanket must be used at elevated pressures. There may also be situations in which the cost of achieving a good isolation vacuum is not offset by improved MLI performance. Now, suppose that we add slots which open a fraction x of the area to direct radiation from 300K. We assume that x is small, 1-x ≅ 1, and neglect the change in insulated surface area. The new value of k with improved pumping is k'. Exposing even 1% (x = 0.01) of the 80K surface will seriously impact the performance of the MLI blanket. On the other hand, at intermediate pressures, with k ∼ 1 x 10-3 W/mK for example (corresponding to a pressure of 0.02 torr), the direct radiation term is about 10% of the total heat load with 1% of the surface exposed. In this case a modest improvement in the pressure inside the blanket would offset the added heat load due to radiation. Careful consideration should be given before cutting "pump out" slots in an MLI blanket. At Meyer we do not routinely cut such slots in MLI blankets and normally would not recommend it. Alternatives to MLI which offer improved performance at elevated pressures have been investigated. Layered composite systems (NASA Tech Briefs article 1219) offer k values that are several times better than the k value for a conventional MLI blanket in the 1-10 torr pressure range and are comparable to MLI at low pressures. Glass spheres, polyimide foam and aerogel in various configurations have also been investigated. ​A good isolation vacuum is needed for MLI blankets to achieve the effective conductivity values typically assumed by designers. If limited pumping time or limited pumping speed make a good isolation vacuum difficult to achieve, then particular attention to fabricating the blanket in a way that allows it to be effectively pumped out may help.